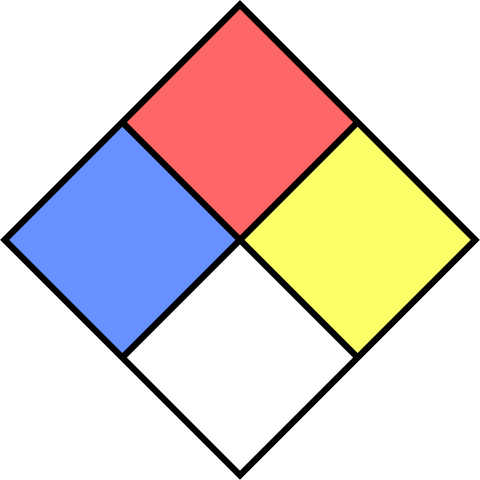 Fitxategi:NFPA 704.svg - Wikipedia, entziklopedia askea. SVG fitxategi honen PNG aurreikuspenaren tamainia: 600 × 600 pixel. Bestelako bereizmenak: 240 × 240 pixel | 480 × 480 pixel | 768 × 768 pixel | 1.024 × 1.024 pixel. oraingoa 09:56, 24 martxoa 2014 600 × 600 (608 bytes) DePiep Colors R=#ff6666, B=#6691ff, Y=#fcff66, W=#ffffff. Comply with W3C WCAG (accessibility; contrast). HSV: H-60%-100% with Hues 0%, 62%, 17%. 12:38, 29 urtarrila 2010 600 × 600 (599 bytes) Tryphon Update as requested by 71.41.210.146 on COM:VP#How do I edit an SVG file on wikimedia commons?.